Put it close enough to family activities that you hear and enjoy it. If possible, put it at eye level when you are seated in order to get the prettiest view of the water flow. Make sure that the location should is perfectly level, and large and strong enough to support the entire base when it is full of water. Slide the pump into the plastic tube that feeds into the bottom of the fountain. Make sure the pump lies flat. Fill the base water as high as you can without the water spilling out the sides. Plug in the pump and adjust the flow. Some pumps are equipped with a flow adjuster. The Little Giant models PESA and PES100, and all the Rio pumps, for example, have dials to adjust the flow up or down. If your pump does not have a built-in flow adjustment, loosen the metal clamp that secures the plastic feed tube over the copper feed tube at the base of your fountain and twist the plastic tube until the alignment of the two bypass holes results in the desired level of flow from the top of the fountain. See the diagram below for further explanation. If your fountain is built on a “pizza pan” or tubular frame, simply put it in the base and follow the instructions above. Each stem has a Union (most Yuccas, Agaves, and medium to large Waterfall type fountains.) If your stem has a union, begin threading the union clockwise into the fountain stem with your fingers and rotate the stem so that the flowers will drop the water straight down into the leaf cluster below (desert plants), or the water will flow to the middle of pan below if (waterfall types). Tighten the union with a 1” open end wrench. PS: If yours is a multi-stemmed fountain, be sure you have the stems in the right place: small with small, medium with medium, large with large. Once everything is all together, fill the base water as high as you can without the water spilling out the sides. Plug in the pump and adjust the flow. Some pumps are equipped with a flow adjuster. The Little Giant models PESA and PES100, and all the Rio pumps, for example, have dials to adjust the flow up or down. If your pump does not have a built-in flow adjustment, loosen the metal clamp that secures the plastic feed tube over the copper feed tube at the base of your fountain and twist the plastic tube until the alignment of the two bypass holes results in the desired level of flow from the top of the fountain. 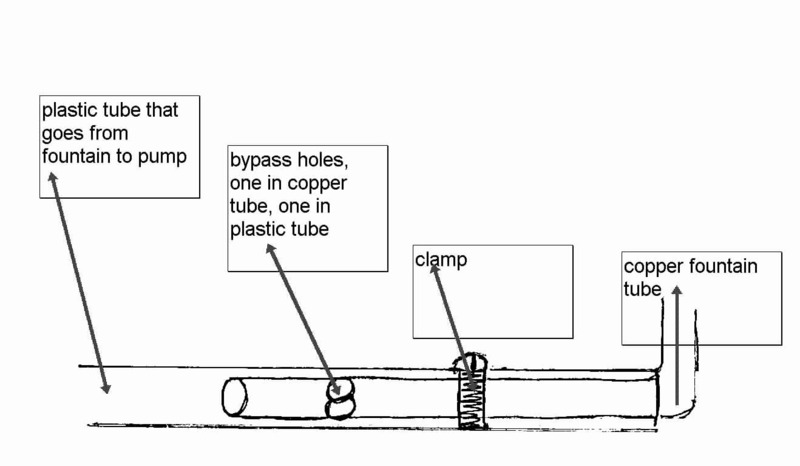 Click on the drawing below for a close-up view of the bypass system. Here's the bypass deal... the more aligned the holes - the less water comes out the top. The more misaligned the holes are - the more water comes out the top. The water should bubble nicely, but not so fast that it creates a problem with splashing.